Today UE E&C had a spike above the resistance level, our system show that there is a turn in the trend. 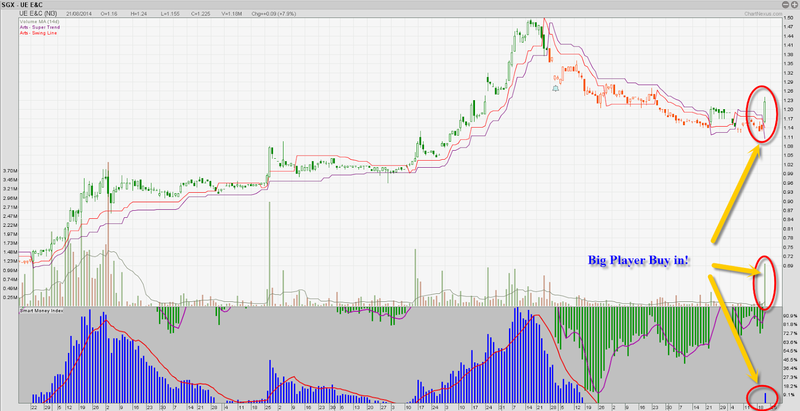 UE E&C could possibly start a new trend from here moving higher. From the past result using our system to trade this stock, we have seen quite high reliability on this stock, meaning most set up have given big profits. UES a wholly-owned subsidiary UE E&C LIMITED provides a wide spectrum of M & E engineering services and primarily untertake projects on an engineering procurement and construction (EPC) arrangement and our capabilities include design, supply, installation, commissioning and service maintenance. Our broad range of M & E Engineering services include high and low-voltage electrical power distribution, ACMV systems, fire protection and alarm systems and sanitary systems. As an integrated M & E Engineering services provider, our provision of value engineering and services across the M & E Engineering value chain allows us to meet the full spectrum of M & E needs of our customers.